Myself, my hubby and our 2.5 year old son stayed recently at Youphoria. We decided to splash out on three days of luxury and enjoyed our stay so much we extended it another day. The villa is situated up a hill just a short drive from Kissamos. Personally I didn't love Kissamos but it was a great place to get supplies, have a coffee, do a spot of shopping so on that basis it was absolutely fine. However the villa is in a truly gorgeous spot, up a hill looking out over the bay with hills on either side. The view is really something. From the villa you can easily get to the fabulous local restaurant Gramboussa - We went twice in four days! http://www.gramboussa-restaurant.gr And the fantastic beach at Phalasrna. We weren't there that long but if you are happy to drive about there is plenty to do. Alternatively a day spent at the villa is equally fun. 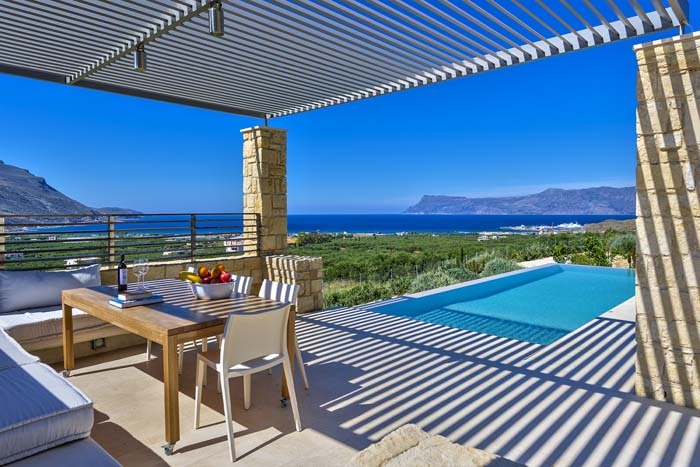 The villa itself has a wonderful outside space ideal for dining in the sun. It even has a bbq. it also has a great pool, but be vigilant with little tots. As always it could be a bit slippy poolside. That said, we never had any problems. Indoors, the villa has everything you might need. Its compact but well equipped especially the kitchen which is really smart. The bedrooms are spotless and romantic, the bathrooms are high end. Overall, the place has a very expensive feel. They haven't cut corners anywhere. The whirlpool bath was awesome. On arrival we were met and fully informed about the house. They even left some toys for our little one to play with along with high chair and cot. I can't massively fault anything it really was one of the most amazing places i have eve stayed. Below are the tiny things which are worth mentioning. A bit hard to find - we missed the turning looking for it. Essentially there is a dirt track directly alongside the petrol station. Keep going through the olive fields and you will get there. It's very new so in years to come when the planting has bedded in - it will be really stunning but there is a bit of building equipment stored at the top. Again, not a problem, never in use and honestly didn't bother me. Just worth mentioning because on first look you may think they are still building at the top. Each villa is really private and we always felt left alone, but some paths run along side to get between the villas so from time to time the people working there will pass. Just worth noting if you need someone very very private. I honestly can't criticise anything else. We had a glorious time all round! We spent 3 nights at Charisma villa which is situated on a hill above Kissamos overloking the sea and olive tree fields. The standard of the newly built villas is 5 stars. The interior design is flawless, modern but still cozy. Kitchen is fully equipped with toaster, juicer, oven etc. Grocery store is 5 min. The outside provides a sun shaded pergola with lots of comfortable seating to enjoy breakfast while taking in the 180 degrees panoramic view. Or to relax during the day. Service is impeccable: house super clean, pool is taken care of daily. The owner Vassili is very attentive. He sat down 20 minutes with us to explain the villa and surroundings and chat about Greece and the local culture. The guy seems really motivated to ensure the guests are happy. Although there are several villas the way they are arranged still ensures you have privacy. That was very important for us and is a big plus. A trip to Chania for dinner and shopping is a nice change to the calm and rural lifestlye around the villa (45 Min.). We tried 2 restaurants within 5 minutes of the villa, both were excellent. In contrast to popular tourist destinations in the mediterranean we noticed that the people of Crete are really friendly, easygoing and not trying to ripp you off or sell you stuff you dont want. That made the experience even more enjoyable. We plan to come back with our kids next time. LOVED this place. Hip/cool/modern. VERY clean. The owner was a massive help. Sent us to great restaurants with delicious food and atmosphere. We are from NY and would like to say know good food... Pool was amazing and very clean. View was magnificent. Location...removed yet near everything. The most amazing beaches very close by and a main town just 5 min drive away to grab whatever we may have needed. I wish it could be my house- didn't want to leave. We stayed in Villa Charisma which was at the end of the villas, which was nice. Lots of privacy. Would def go back!